For the fifteenth consecutive month dating back to November 2014, the US CPI remained less than 1.5%. While this was supposed to be the year where “transitory” effects of oil prices as well as “other” factors dissipated, only in January has the full CPI been above 1.1%. Much like the PCE Deflator, the Fed’s preferred inflation gauge, there is no acceleration evident, with calculated inflation sticking at around 1% compared to around 0% last year. Thus, if there were any “transitory” factors, they would only explain about half of the Fed’s target failure. The persisting inability of the Federal Reserve (or any global central bank) to achieve its most basic mandate (as it is sees it) is in sharp contrast to the period from just before the Great Recession. During the height (depths?) of the housing bubble, calculated inflation rates either the CPI or PCE Deflator were consistently above the 2% policy target – even when and after Alan Greenspan had raised the federal funds rate considerably. It is quite good evidence on both sides of the GR that the Federal Reserve was and remains more a spectator than a powerful monetary agent while also arguing that the Great Recession was therefore no recession. That doesn’t mean, however, that there aren’t any inflationary effects from monetary policy. 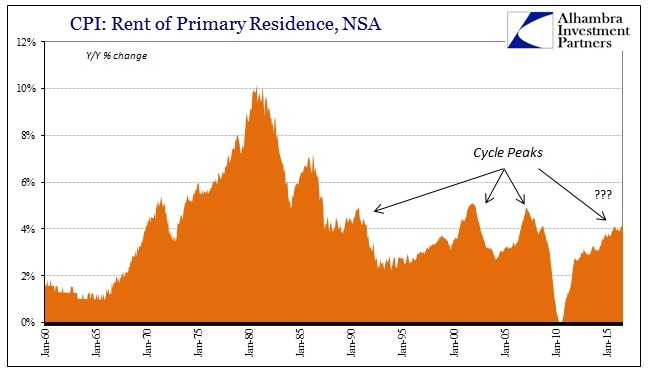 During the aftermath of the non-recession GR there was a mini-boom in housing, particularly turning formerly abandoned or foreclosed properties into rental units under MBS cover of QE. 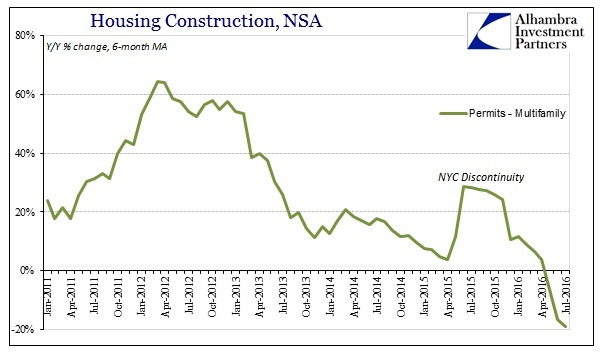 There was also a brief surge in apartment construction, all due to the narrow opening in this form of artificial credit growth. Volume growth has been much, much less of late, meaning that companies (institutional home buyers and builders) are more dependent than ever upon price increases to either continue or even attain profitability. That so much was debt-based means that there is little discretion to pricing. The result has been a noticeable increase in the cost of renting, reflected in the CPI subcategory of tabulating the change in price of renting a primary residence. Upon first inspection, though, while certainly elevated it doesn’t appear as if rental cost inflation is unusually high or out of alignment. 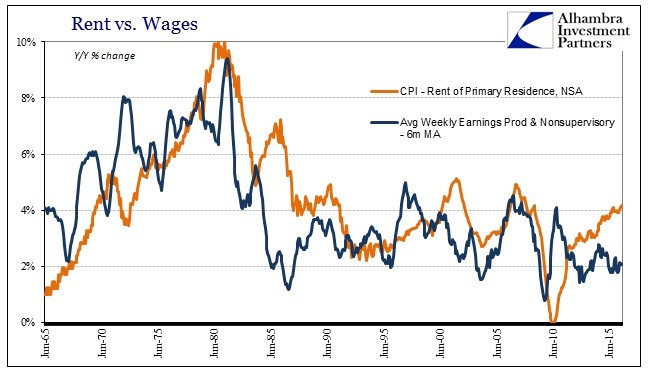 Compared to prior cycles (which is already a dubious proposition given that this current economy is no longer cyclical), at 4% and slightly above, the CPI rent component is only now starting to push closer to what were prior peaks. That might suggest there is room to absorb further price increases before rents become a more serious problem. One factor arguing against that interpretation is the significantly lower home ownership rate since the housing bust; meaning that rising rents apply to a bigger proportion of the economic base, and thus a 4% increase while perhaps not as big a rate as in prior cycles is spread out to affect a significantly broader segment. In that way, comparing the current price behavior to prior cycles is at the very least a much less precise endeavor. In addition, the more appropriate comparison for interpreting rental prices is not with prior history but to the current state of income. Using nominal weekly earnings, for instance, shows that there is a very big and concerning difference between 4% rental cost increases now and 4.9% in early 2007. 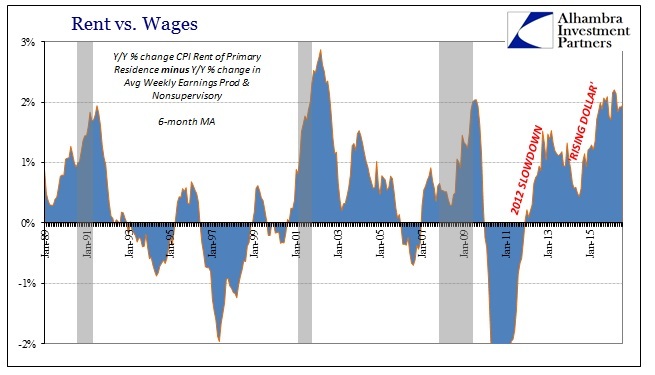 When rental costs were rising at nearly 5% then, nominal weekly earnings for production and non-supervisory employees were rising at about 4% to 4.5% at the same time. 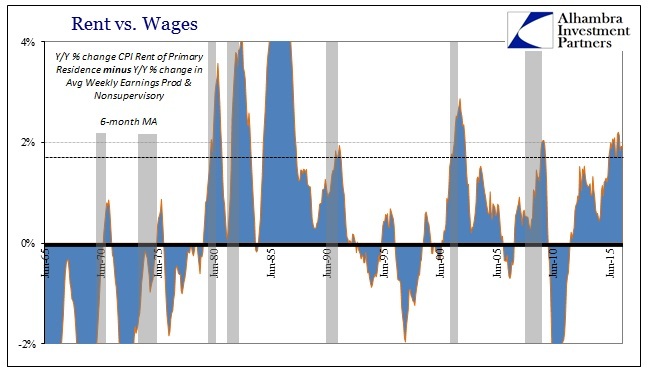 Therefore, while rents were going up rather sharply, so, too, were nominal earnings to at least keep pace as they had been during the mid-2000’s recovery years. It wasn’t until later in 2007 and really into 2008 that the disparity grew to troubling and painful (for not just consumers) levels. Going back through the history of each of these data series shows that recessions almost exclusively appear where earnings and rents diverge to a significant degree. I want to be careful and clarify that I am not asserting causation; far from it. In other words, the data does not suggest that when rental prices are rising much more rapidly than earnings that that causes a recession, rather it is almost certainly that the recession itself causes the drop in earnings which then encompasses the disparity with rental prices that makes a recession feel to consumers painfully like one (and further depresses especially discretionary spending). Apart from the big difference in the mid-1980’s, whenever we find earnings growing significantly slower (1.5% to 2.0%; CPI Rent minus Avg Weekly Earnings) there is recession – until 2015 and 2016. The distance between earnings growth and rental growth is as big as it was during the worst of the Great Recession, as well as the 1990 recession and the start of the dot-com recession. Again, I am not claiming that we should by this one comparison expect a recession in the United States, only that to many people who are lucky enough to be working, the past two years or so must feel like one. Undoubtedly, no matter what Janet Yellen may say about the economy and its prospects, you can be sure that these people (and, again, the proportion of them is much larger this time) are acting upon what they see and feel rather than what they hear her say for the nth time in a row. This surely does not explain all of what we find in the persistent and apparently durable “manufacturing recession” or the slump in retail sales and other places, but it adds to the validity of why the economy in so many ways acts as if it were stuck in a long, stubborn recession-like state that doesn’t ever improve. As the difference between nominal incomes and rental costs grew still further especially late last year and so far this year, it is then unsurprising to see discretionary sectors such as autos suddenly run into a “plateau.” It may not be recession, but a significant proportion of the population is beginning to act like they are in one. 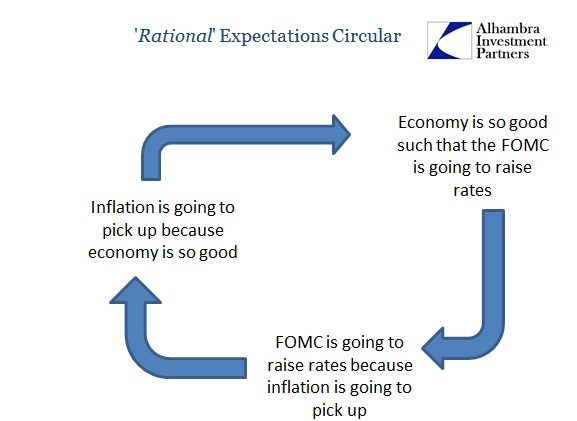 From the real (as opposed to statistically modeled) perspective of far too many people, the Federal Reserve has put their economic fortunes in a vise to be squeezed from two sides – the first is the failure of monetary policy to create the recovery that would have perhaps harmonized earnings and wages with rental increases while at the same time creating more housing distortions partly responsible for those rising rent costs to begin with. 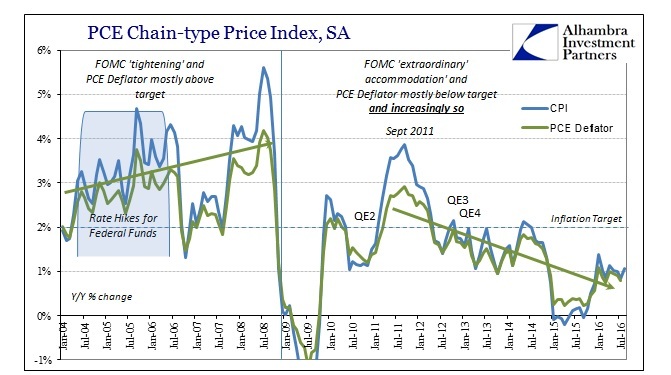 In short, there is nothing in the inflation data that can be attributed positively to central banking. On the whole, it remains as ineffective as ever, and where it did intrude it did so in a manner that only increases the pain of its failure in narrow forms of what it claims it is trying desperately to create. That, in a nutshell, is the all-too-consistent result of top-down monetary policy; central bankers have a unique ability to consistently make a bad situation worse. They really don’t know what they are doing.